Big Brother nightmare or cool new feature? 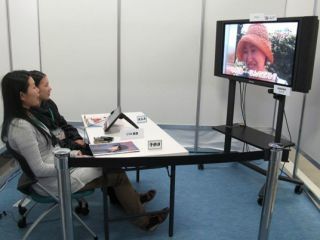 New Japanese TVs are being developed that are able to watch the viewer and measure their emotional response to what they are seeing on the screen. Is this a whole new Bladerunner-­esque Big Brother nightmare waiting to happen? Or is it actually a cool new feature that might somehow improve our enjoyment of TV in future? The new tech comes courtesy of NHK Science & Technology Research Laboratories (STRL) of Japan, who plan to put small cameras in TVs to observe viewers' responses to the content on the goggle-box in front of them. These tiny cameras will be able to analyze movements and facial expressions in order to decide on which type of content (ie advertising!) makes you happy and which doesn't. The latest UTAN (user technology assisted navigation) TV viewing interface has a camera mounted on the TV which estimates degrees of interest, concentration and suchlike from the viewer(s) in front of the TV. If the viewer's expression does not change for some time, then the tech concludes that they are concentrating hard on the TV content in front of them. The camera can also identify if you are happy or angry or bored, with the potential to identify individual viewers and serve up relevant advertising based on their profile, much like Facebook or Gmail currently fails to do successfully.